Before starting the big celebration, let’s raise our mugs of beer and drink a toast to Saint Patrick! Smiling Leprechaun with pointy ears and big smile while wearing green hat, vest, shorts and pointy shoes. 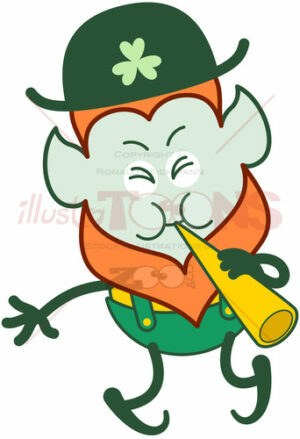 He’s pointing upwards with his finger, trying a dancing step and drinking a toast of beer for Saint Patrick.